You can show recent announcements as part of your Course Home Page. You can set the number of announcements that should be displayed. The Course Home Page only displays text and links within announcements; any images or media will not be shown. Select the Show recent announcements on Course home page checkbox. 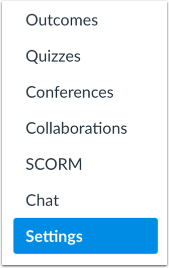 In the Number of announcements menu, select the number of announcements to show on the home page. You can show up to the most recent 15 announcements. Previous Topic:How do I enable course self-enrollment with a join code or secret URL? Next Topic:How do I hide totals in my students' grade summaries? Table of Contents > Settings > How do I show recent announcements in the Course Home Page? Re: How do I run my announcements through my home page?